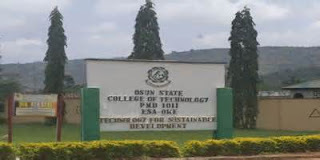 Osun State College of Technology (OSCOTECH), Esa-Oke, National Diploma (ND) and Higher National Diploma (HND) Admission List for 2018/2019 Academic Session. All Candidates that applied for admission into the Osun State College of Technology (OSCOTECH), Esa-Oke, National Diploma (ND) ad Higher National Diploma (HND) programmes for the 2018/2019 academic session are hereby informed that the admission list has been released. Kindly log on to OSCOTECH admission status checking portal via http://eportal.oscotechesaoke.edu.ng/adm_status/. Candidates admitted into OSCOTECH ND full-time programmes are advised to go to JAMB portal to accept or reject the admission offer.